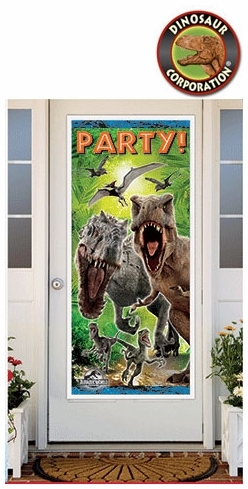 Home | PARTY SUPPLIES | JURASSIC WORLD | Jurassic World Door T-rex Decoration Poster 60" x 27"
Jurassic World Door T-rex Decoration Poster 60" x 27"
Jurassic World Door T-rex Decoration Poster make guests entering a brand new world with this birthday party decoration. Roaring, running and flying dinosaurs are all featured on the Jurassic World Door Poster is made from water resistant plastic, can be used indoors or outdoors. Featuring a bold image of Jurassic World's most menacing prehistoric creatures, including Velociraptors, pterodactyls and the genetically modified hybrid dinosaur Indominus Rex. Let guests know where your Jurassic Park birthday party is. To really capture the thrill and adventure of the Jurassic Park films at your celebration, be sure to look for our other Jurassic World decorations and party supplies.